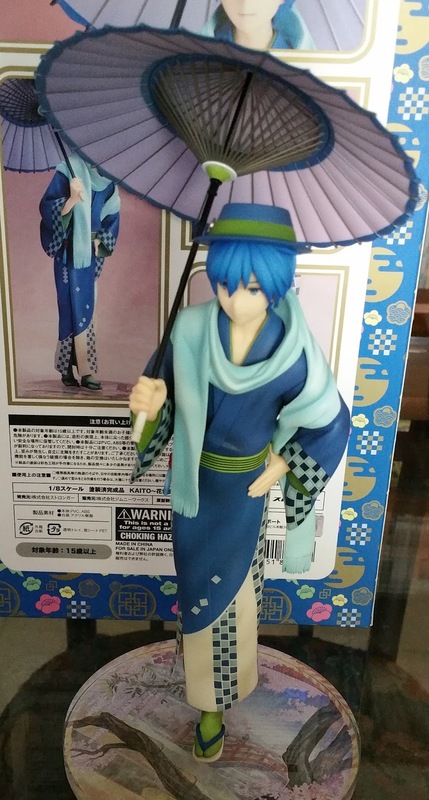 Hanairogoromo Kaito has the feel of a father! That's what many collectors say on myfigurecollection and that's exactly what I think too. Well, people in olden days do marry much, much earlier than we do now after all. Hm... how about a WANTED poster of Enbizaka's most malicious, psychotic tailor? I'll love to create that diorama someday~ And you'll definitely get a step-by-step tutorial when that happens, no worry! This month is one of my most expensive months and I split my packages into two separate ones. 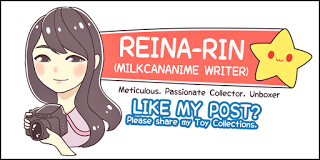 The first containing Phat's scale of Nanami Chiaki (which I have reviewed and you can read it here) as well as an Ao no Exorcist clear file, and Nendoroid Oikawa Tooru and Iwaizumi Hajime. 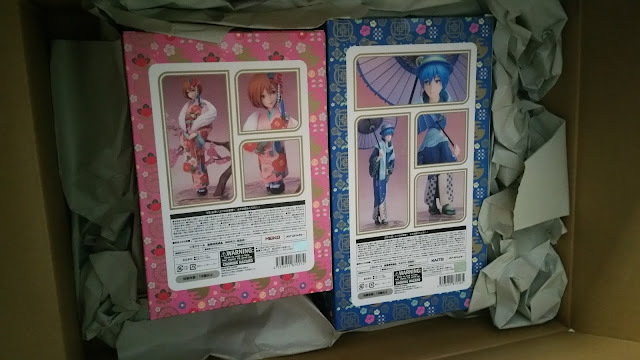 The second package contains (obviously) Hanairogoromo Meiko and Kaito. I already have Hanairogoromo Miku with me (review here) and have Luka on pre-order. If it isn't obvious yet... I plan to collect all from this line and have them lined up and gaze upon the beauty of traditional Japanese clothes (wafuku) in awe. Now, let's appraise the outer box. I never really liked Hanairogoromo's outer box. They are elegant and pretty with all the repeating gold embroidery patterns but it has never appealed much to me, possibly due to the small size. 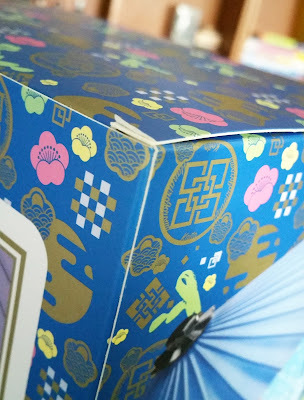 Don't get me wrong, small boxes make it so much easier to store, but there is some kind of beauty about the larger boxes that just makes it look so much prettier and eye-catching. Still, back to Kaito's box, we see that it is in blue instead of Miku's red, which matches the main color of his attire. This makes it seem like there's a ton of blue going on for Kaito (blue hat, hair, scarf, clothes) and his other contrasting color is green (ribbon on hat and socks) which I will cover more later when I talk about painting. I love how gold words and patterns are all around his box as it really adds a splash of color to an otherwise overly-blue figure and box. Sadly, due to how wafuku prioritizes beautiful and intricate designs for females and as a result, leave males with plainer designs. Kaito models that out perfectly when contrasted against Meiko and Miku (who have also been released at this point), and hopefully he comes with enough subtle details to make him as pleasing as the girls are! 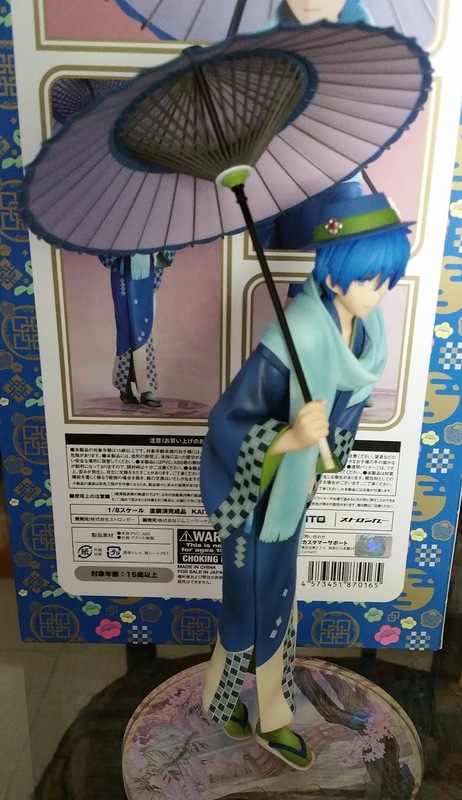 A simple 360 of the box shows Kaito in a few views, mainly focusing on what is pretty about him--face, pose, parasol and of course the pattern at the bottom of his outfit, which has a majority of white (instead of blue) which contrasts well and becomes really eye-catching. 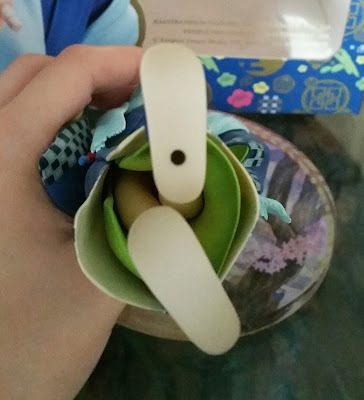 I would also like to take this opportunity to talk about how damage during shipping is likely to be inevitable and I am just glad that this slight peeling of the box is all the damage I got. 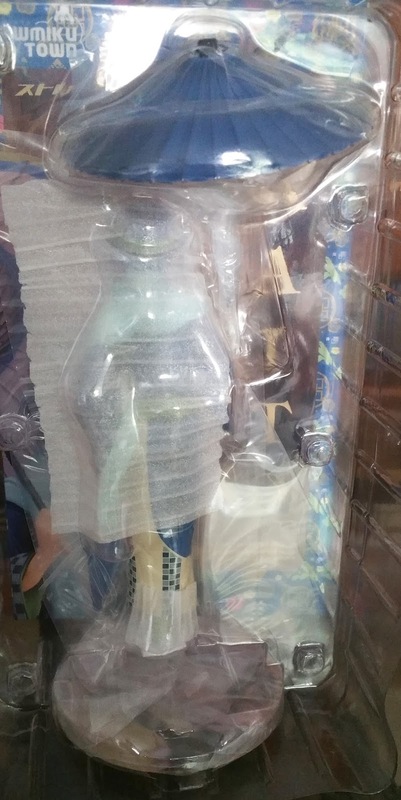 Similar to Miku's, he comes with the exact same backdrop in the box, which is coincedentally the same one they had for the illustration picture, so it is probably safe to assume that that is what we'll get for all the other figures in this line as well. Blister-wise, it is securely pushed in and taped around to prevent shifting. 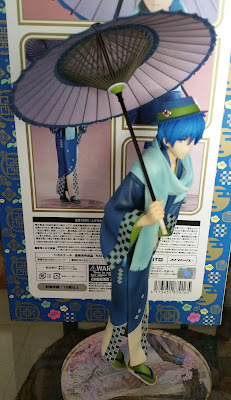 He also comes with really minimal parts, just a parasol, base and himself, all adequately spaced so there's no overlap of items that might incur damage during shipping. You can also see the hints of green on the figure already. 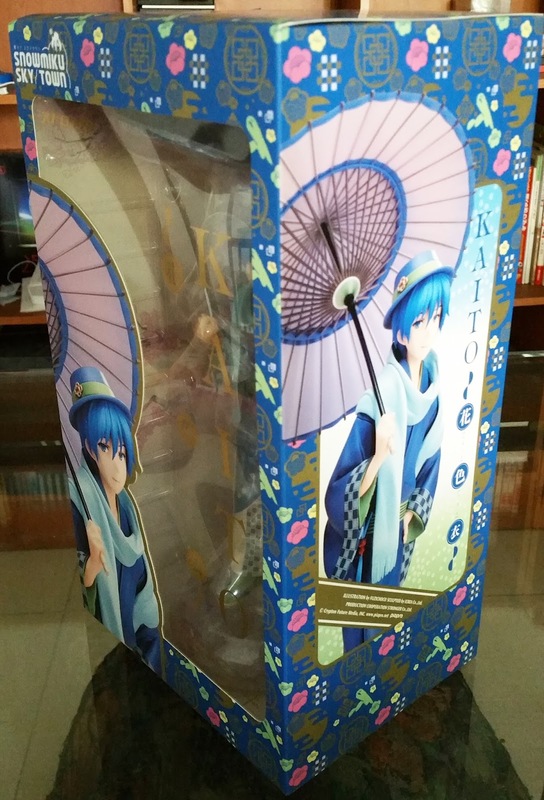 Foam sheets are also placed behind Kaito to help cushion him... perhaps due to his bent pose which might be fragile? 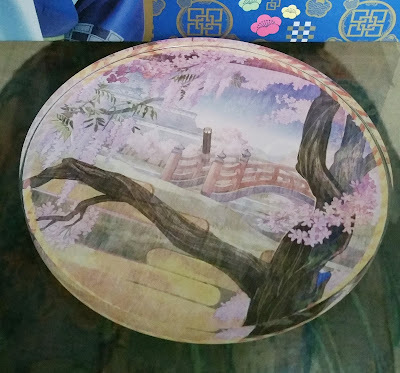 This is the exact same base as Miku's and I'll also leave a comment here to mention that it is the same design as Meiko (as well as the background sheet) so I expect to see the same for Luka, Rin and Len. Honestly, I would have preferred if they came with a slightly different deisgn so they could paint a scene with just their bases but you gotta take what you get! 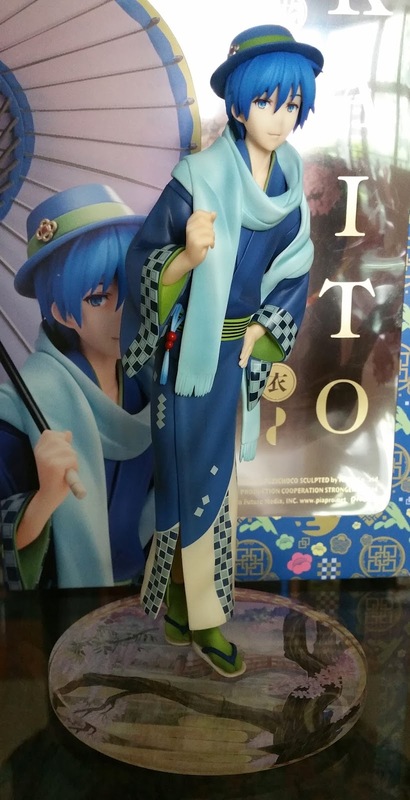 Kaito is a beautiful figure and you can see the amount of detail on his outfit without me zooming into any individual details yet. Still, I am fully intending to do that and I'll like to first talk about his outfit before moving on to his accessories such as his hat and parasol. The majority of his outfit is in a plain navy color and it hugs his lean figure quite nicely. 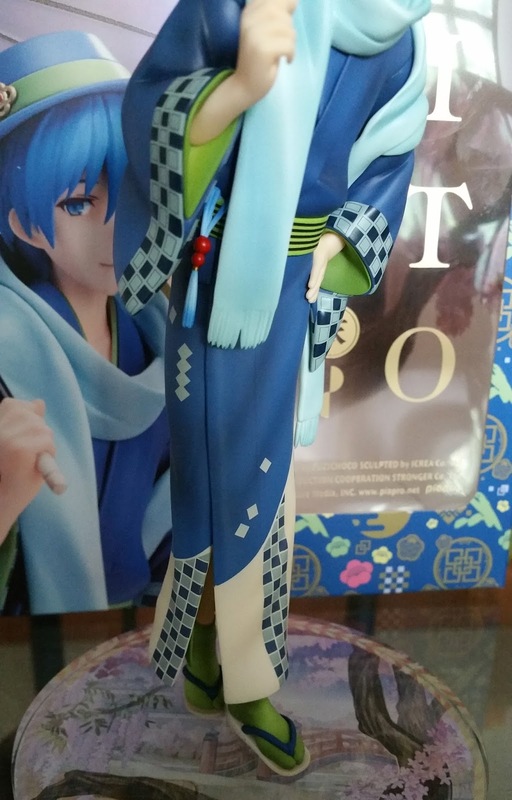 There are slight creases all around, especially at his thigh area, which goes to symbolize how lightweight and "figure-hugging" these outfit is, just like how wafuku usually looks, same for both genders. 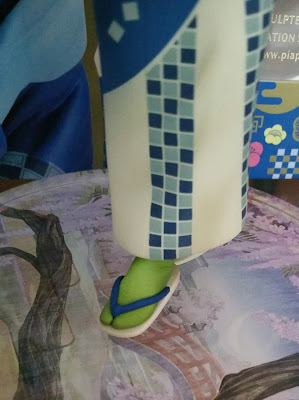 I like how the bottom opens up and you can get a sneak peek over at how his tabi (traditional Japanese socks) end and moves to his skin. 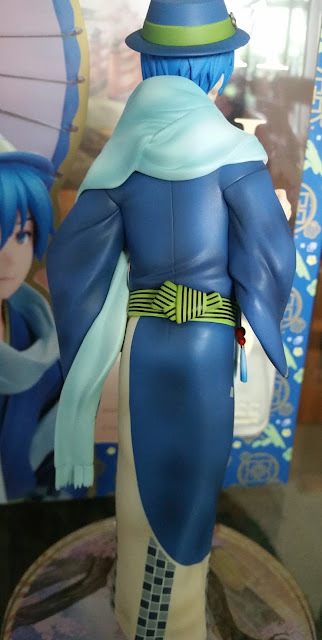 You can see that the socks look exactly like an additional layer sculpted above his skin, and not sculpted together on the same layer as his calf. His scarf looks very long yet lightweight and the ends of his scarf adds in a very Western touch, which matches the era that these outfits were popular. This is quite a nice detail to include! Taking a closer look at the checkered pattern of his outfit, we see that there are some white squares on the navy portions which add nice contrast and detailing to the flat color. 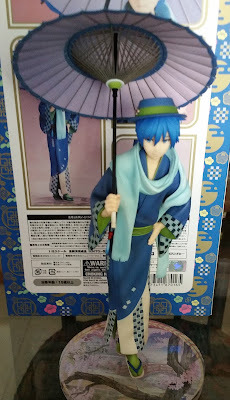 The white part near the end of the attire also adds in a slight detail to try to brighten up his attire and comes with immense amounts of shading to add dimension and depth. At that area, you can also see that he has more strips of blue checkered patterns going down vertically to tie back to the main color. Though, I must admit that those strips just look like bathroom tiles to me >w>!! The checkered pattern lines his sleeves too and it uses a form of optical illusion as these look darker than the ones at the white patch though they are of the same shade. 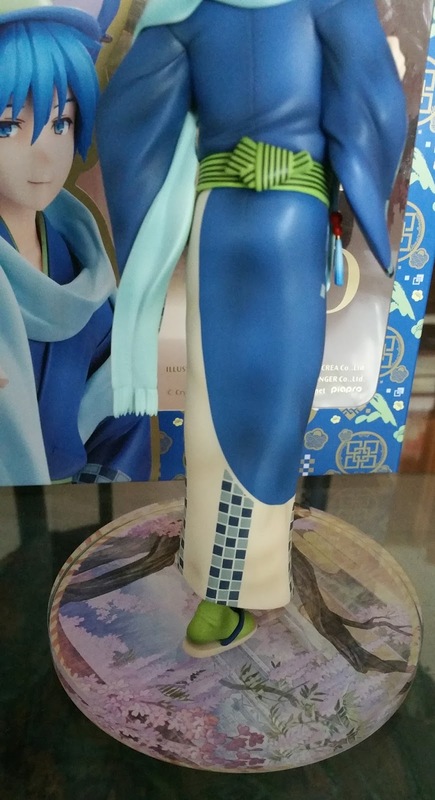 The inside of his sleeves are in a shade of green that is... apparently his chosen contrasting color as you see it at his obi and tabi as well. A closer look at his tabi shows that there is indeed shading going around the green, especially closer to where they meet the shoes. 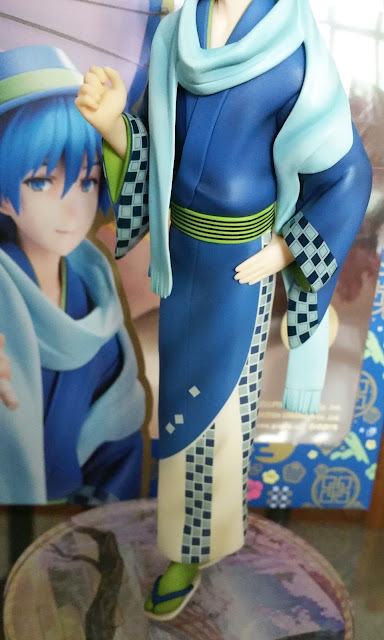 Sadly, there isn't much sculpting going on to show how the tabi is pulled and creased from Kaito's pose or from the navy straps. 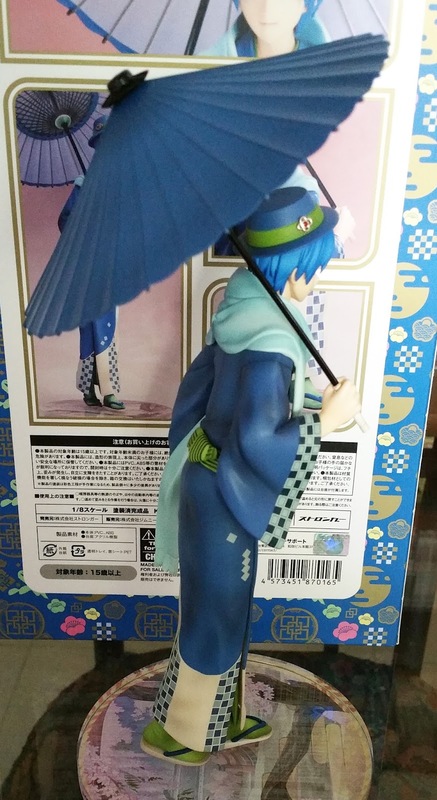 From the back, we see that many of the details that I mentioned earlier are preserved and the green tabi even has shading for his ankles! There is a seam going down his back, which is actually how these kimono is supposed to look like so... yay for not hiding the seamline? I'll like to draw attention to his obi as well, which is green with navy stripes. 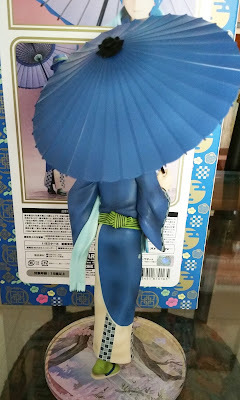 The stripes are very cleanly painted and adds to the obi by increasing the level of detail instead of damaging the looks of this figure. Just like what an obi does for the kimono, here it ties the entire outfit together by becoming that single silver lining we needed. But well, that's not all! One thing that I really didn't like about this figure is how chunky the scarf looks from the back. 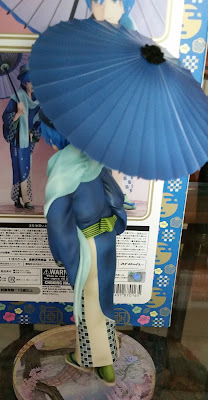 As you can see from the image above, his scarf is made is two very huge layers and this extends very high up and you cannot see his neck from the back. 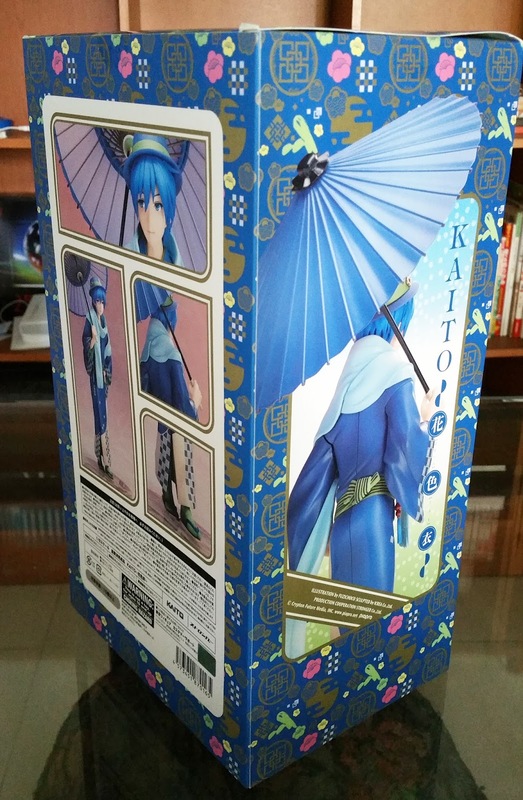 This makes it look very heavy and not at all comfortable to wear, unlike how it looks from the front. 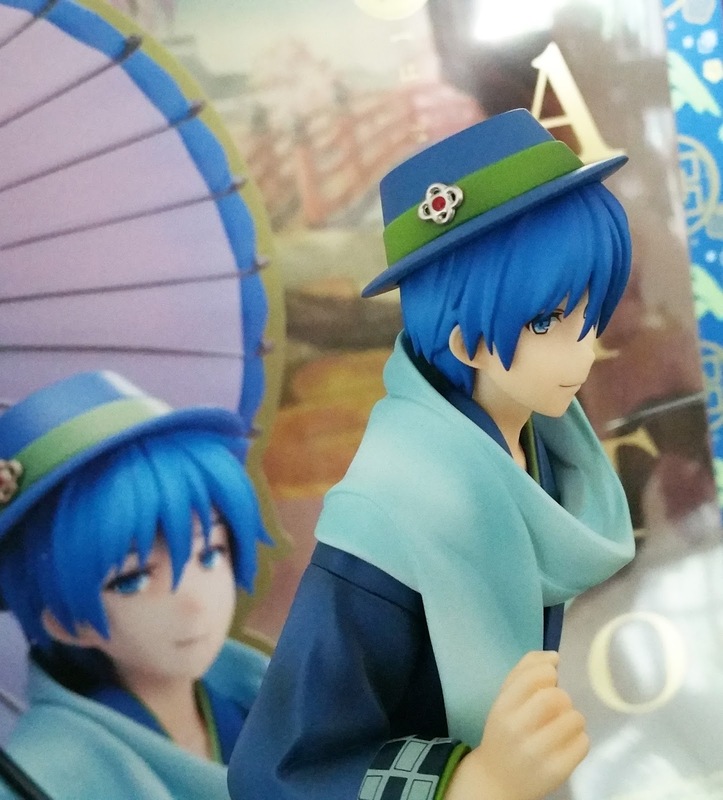 Now, let's move on to the other accessories that Kaito comes with, starting from his hat. His hat doesn't have much shading but is accentuated by the small detailed badge attached to the side. The red ruby with the silver flower-y pattern adds a splash of detail and color that you can't find anywhere else on this figure! 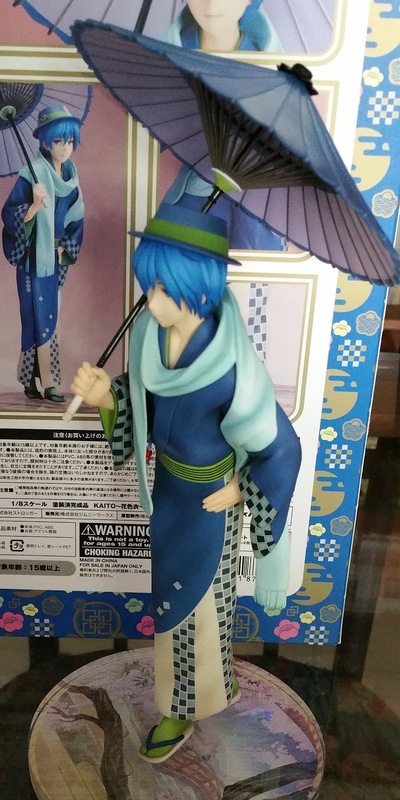 And of course, we have his trustworthy little parasol! This is how the underside looks and it actually has a pale pinkish-purple hue. I love the detail of the green dot right in the middle, lined around its circumference with white, and the "strips of metal" going down the parasol to the center and all these really make the parasol come to life! It looks as realistic as it can get, just shrunk down to scale! 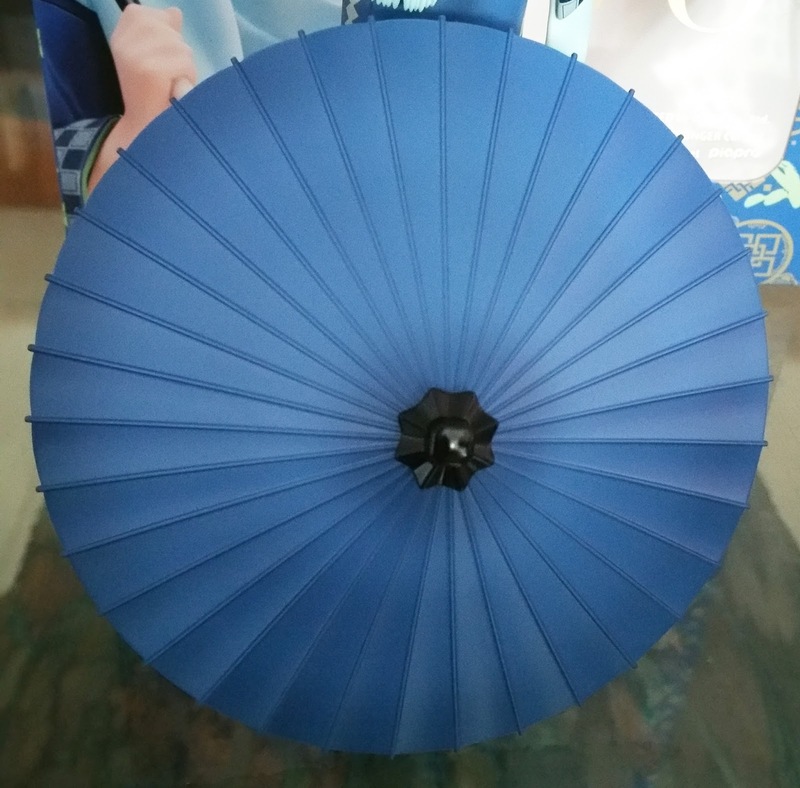 The back of his parasol is a single blue color but you see little details like the black center and the shading hear it as well as at the outer ends of the parasol. 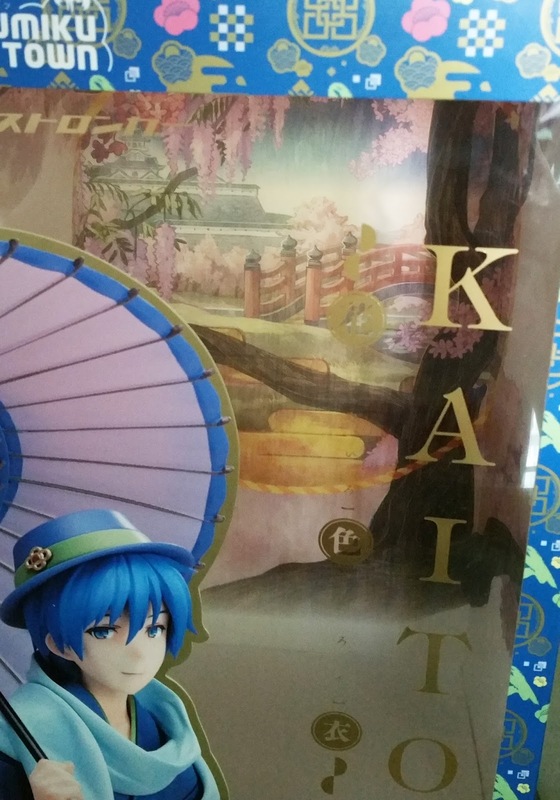 I love Kaito holding up the parasol but as you can see from the 360 below, at some angles it may look like the parasol is held a little too high. However, this is similar to how the prototype Kaito held it, yet the parasol looked much shorter then. 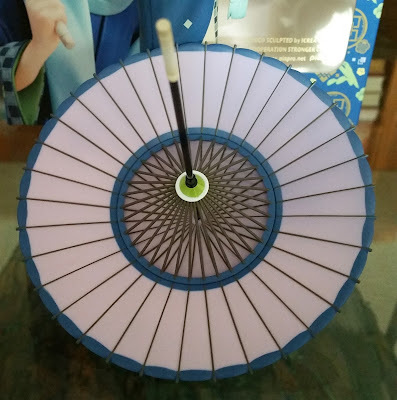 This could be a problem which arose due to angles or translating something in 3D to 2D, where something in real life looks slightly different when in a picture. 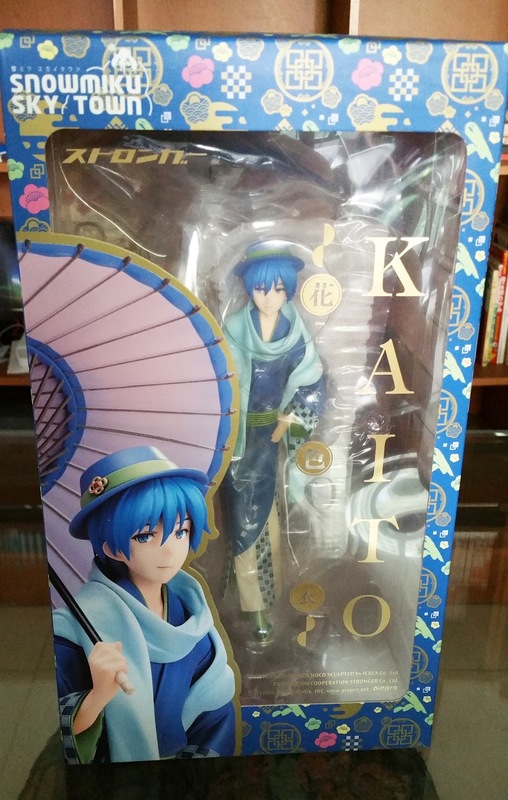 This is one of the few, if not the only, figure of Kaito I'll probably ever buy and I'm proud to own him. Someday, when Rin and Len gets released, I'll be able to line this full set up and gaze upon it with awe because the wafuku and vocaloid cast just fits my tastes so perfectly! No Comment to " Figure Unboxing and Review: Hanairogoromo Kaito "